No school hours, no schoolroom, just learning all the time. It’s conscious on the part of the parent, while the child merrily learns, sometimes oblivious that anything special is happening. 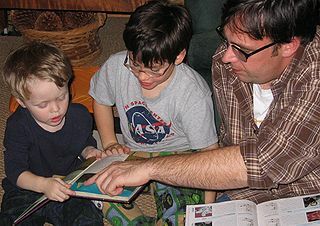 Unlike radical unschooling, the parent has more input in what the child learns. Unlike school-at-home, it won’t look like school, because it’s stealthy! A big part of stealth learning is creating a home environment that makes it easy for a child to learn. Activities are planned, field trips are taken, questions are answered, and books are read. There won’t be a designated time to learn because stealth schoolers understand that learning shouldn’t be turned on and off. There are no school hours and no designated recesses because learning is slipped in throughout the day, all year long. There is no need for a vacation from school with stealth learning! Stealth learning probably comes closest to describing the approach I took in homeschooling my son. It wasn’t called stealth schooling then, and I’m glad to see the term being used now. It’s clearly on the unschooling spectrum, but I think it will resonate with more families. A lot of stealth schooling is, well . . . stealthy. We look for opportunities to learn. Instead of a math worksheet, we might deliberately plan to double a cookie recipe and ask a young child to help tell us how much to put in the bowl (always asking for real help and not turning it into a quiz). Many games involve math, so you can learn to add with a timed worksheet, or you can add dice or play dominoes! Before you roll your eyeballs and say this is too simplistic, the same concept applies to advanced math. If you are using math in life, (and that’s the whole point of anyone learning it, right?) involve your child in the process, and he will learn. I was practicing stealth schooling whenever I asked my child to write down something on a shopping list for me. I’d pick a time when I appeared too busy to write something down (usually cooking or doing dishes) and I’d “remember” something we needed and ask my not-yet-spelling child to write it down for me. He started to write, realized he needed help, and asked me how to spell the word, so I told him. He learned how to help me, how to spell that word, and the unspoken message was that learning to spell was useful.Very stealthy! In our family we helped nudge along interests and learning without making assignments. We made it easy for him to find new things! We utilized the library and I regularly brought home books that were just waiting to be discovered. I didn’t require that they be read. They were just there to be found, and usually they were. When he was elementary school aged, we’d talk about things during breakfast, and I’d sometimes ask quiz questions from cards that I found at a thrift store. That was loads of fun because we were playing a game. If he knew the answer, great. If he didn’t, we’d talk about the answer. It was a hodgepodge way of learning that was very stealthy. I’d also put sentences on the white board that needed correcting, and that was another “game” he loved! So I took something a bit schooly but didn’t make it an assignment. He’d discover it on his own and make the corrections. Not school-at-home, but it helped him learn spelling, punctuation, and grammar while giggling at the silly mistakes. Stealthy success! When my husband brought a tall ladder into the family room and proceeded to make a pendulum, he was practicing stealth schooling. My son and his friends had loads of questions and had a lot of fun that day! My husband didn’t wait for our son to ask about pendulums (unschooling) nor did he pull out worksheets (school-at-home). He just provided some memorable information about something he thought would be good to learn about and let the kids in the house do what they wanted with it. Super stealthy! The week I decided to organize the thousands of books in our house (I was losing track of what books we had) was turned into a stealth lesson because I involved my child in what could have otherwise just been a housekeeping project. We talked about a plan, and the books were then sorted by fiction and non-fiction, and then the fiction was alphabetized by author’s last name and the non-fiction by general categories so we could more easily find them. It took a lot of thinking to sort all of those books, so that was the first part of my stealth learning project. The second part was that I hoped he would discover some books to read, and he did. Double score in the stealth learning that week! We had more than just fun in mind when we took our son to places like the Jet Propulsion Laboratory and Cal Poly Engineering open houses. Clearly advanced math and skills were needed to do the cool things happening there, and we wanted him exposed to that while having a totally fun day. Some time later, I followed up by mentioning that advanced math was necessary for some of the things he seemed to be interested in, and did he want to start formally learning it? His answer was yes, so I selected several math programs that looked good and let him pick the one he liked best. It was up to him to work on it when he wanted and to correct his own work (I was stealthily encouraging independent skills). So it wasn’t radical unschooling and it wasn’t school-at-home, but a collaborative arrangement on his terms with our guidance and support. We’d helped him reach that point by years of stealth learning and exposing him to things we thought would help him. Kids are amazing learners and they thrive with stealth schooling! I’m definitely on the unschooling spectrum. But I also found ways to nudge learning along by exposing my child to things he might not otherwise have discovered on his own. I didn’t always wait for him to come to me with something to learn, but I also didn’t cram unwanted information in him (well, ok, I tried that when he was 6 and soon learned it wasn’t a great plan). Stealth learning may not always appear orderly (no uniform year-by-year state standards), but it’s natural and it works! It doesn’t have to be used exclusively, but it’s worth trying now and then and seeing how it might work for you and your child. My son is grown now, but I continue to practice stealth learning with other kids (as does my husband) because it’s just so fun and we know it helps them. I now realize that all the fun I had with my grandmother was really her way of stealthily teaching me. I’m not sure if she was ahead of her time, or if we are simply rediscovering one of the best ways to teach kids. Written by Karen Taylor, posted on 5 May 2013 at 9:26 pm, and filed under Gifted, Homeschooling, Learning Ideas, New homeschoolers, Unschooling. Bookmark the permalink.